The manner in which German POWs were treated after the war was deplorable. Whereas during the war the treatment by both the German military authorities of Allied prisoners and Allied military authorities of German prisoners was "correct" in terms of complying with the Geneva POW convention of 1929 (99% of American POWs taken by the Germans returned home), when the fighting stopped, so did compliance by the Allies with the convention! * The first hurdle was to escape "summary execution" by whoever captured them. This was by no means a rare occurance. 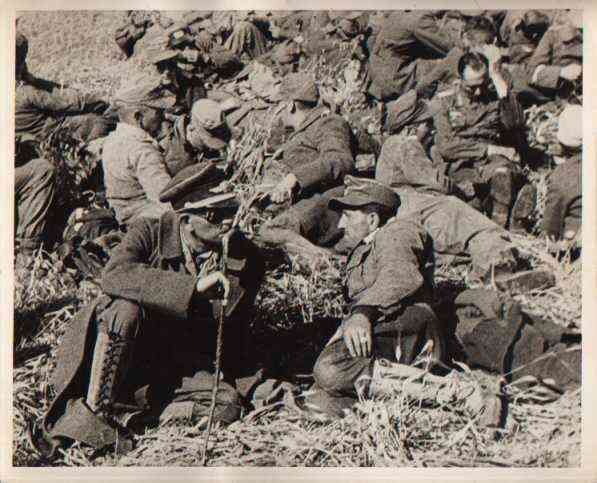 * The second trial was to survive the brutal conditions that captured German soldiers were forced to endure. The Rheinwiesenlager were the final resting places for many German Prisoners of War. The English translation of "Rhine meadow camps" makes them sound like nice places; the actual conditions there were far from pleasant, as can be seen in the following photo (Note the lack of shelter and facilities)  What is generally not well known is that the shortage of food and water causing constant hunger and thirst, the miserable accomodation meaning that everyone was completely unprotected from bad weather and the witholding of medical facilities resulting in epidemics, that all contributed to the eventual death of so many POWs in American-run camps, was part of an overall plan! The responsibility for the treatment of German POWs held by the Americans fell under the auspices of the US Army in Europe; the commander of that army, General Dwight Eisenhower! It should be noted that at the end of the fighting in Europe, the British and US authorities basically scrapped any adherance to the Geneva Convention of 1929. With unbelievable arrogance they avoided accusations of not looking after German POWs by simply abolishing that term, from then on referring to them as "Disarmed Enemy Forces" (DEFs) or "Surrendered Enemy Personnel" (SEPs); they could now not be accused of mistreating POWs because they no longer had any!